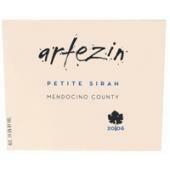 Artezin Petite Sirah Mendocino County - 2007 A blending grape for generations, Petite Sirah has now come into its own as a noble variety. It has found a home in the Ukiah Valley including excellent sites along the Mendocion Ridge and the Talmage Bench. The warm temperatures at these locations allow Petite Sirah to fully ripen giving exotic aroma profiles and full, yet supple tannins. Three distinctive varietals combine lush berry and fierce spice into a wine characterized by its incandescence. Deeply luscious and succulent blackberries ignite this vintage of our rich ruby apparition. Aromas of anise and sweet fig are embraced by touches of black pepper. From the shadowed dark depths, subtle notes of cloves and vanilla emerge and compliment the concentrated fruit characters of this wine. Captured in 1, 2 and 3 year old American oak barrels, this wine showcases the best these distinct varietals have to offer. Though this wine is remarkable now, age in the bottle will only integrate the three unique varietals more. Welcome the winery ghost into your home again with this latest vintage, and enjoy with full-flavored and hearty meals…before it vanishes again.